Frustration is mounting in Edmonton. We are well into Connor McDavid’s fourth professional season and, quite frankly, the Oilers have very little team success to show for it. McDavid has established himself as the most talented player in the entire National Hockey League and already has a trophy room filled with hardware to prove it. But you won’t find any team awards in that room – not yet, anyway. The McDavid-era Oilers are marked by two common themes – ridiculous, highlight-reel performance from McDavid and the top line, and futile results from everywhere else in the lineup. Let’s keep in mind that McDavid has won back-to-back Art Ross trophies, and was seriously in contention for the league’s most valuable player in 2017-18. One could argue that the only reason he didn’t beat out New Jersey’s Taylor Hall – he was 15 points clear of Hall in the scoring race – was because Edmonton missed the playoffs by a mile. Pressure has been mounting on the Oilers front office and coaching staff to deliver results this season. Those results just haven’t come. 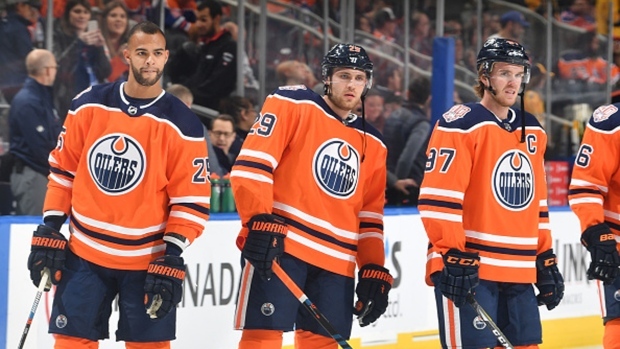 The only thing we have seen from this year’s Edmonton team is another top-heavy group that gets absolutely nothing from the depth of their lineup. Even in what appears to be the weakest Pacific Division in a decade, the Oilers are still struggling to get something going. How does this read? Well, Edmonton’s top scorer – that’s McDavid, of course – is responsible for 20 per cent of Oilers goals this year. Add Leon Draisaitl, and you now have explained more than 40 per cent of Oilers goals this year. Add Alex Chiasson, and you now have explained 55 per cent of Oilers goals this year. Three players account for 55 per cent of Edmonton’s entire goal scoring on the season. Draisaitl is one of McDavid’s most frequent teammates this season; Chiasson has mostly seen middle-six ice time and has been Edmonton’s only success story from the depths of their lineup. Top forwards are expected to carry the bulk of the scoring load, but not to this magnitude. 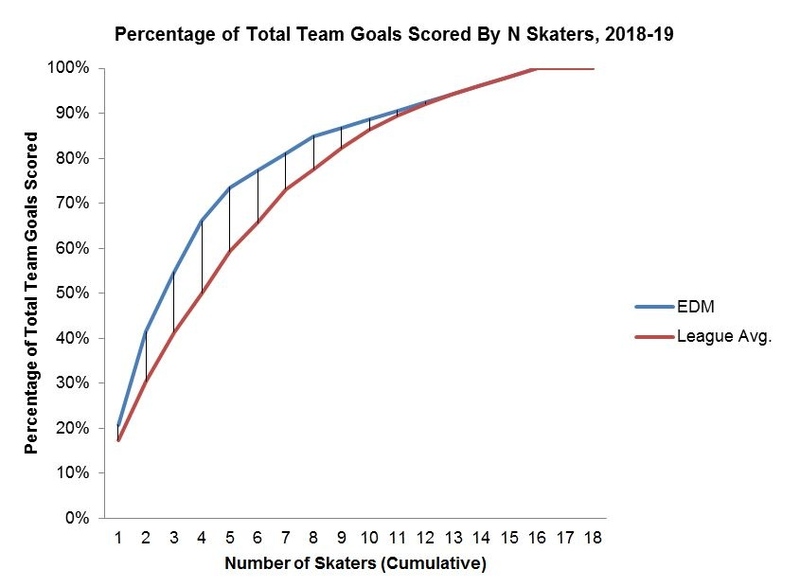 Top lines generally account for around 40 per cent of team scoring and when you expand it to the top-six forwards, you should have about 66 per cent of team scoring accounted for. The Oilers are a massive deviation in both instances. 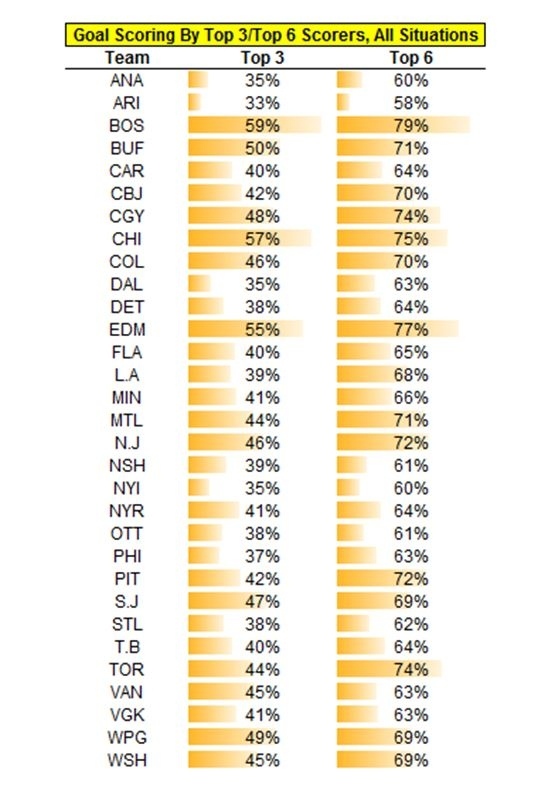 The only two teams that are as comparatively top-heavy as the Oilers are the Boston Bruins and Chicago Blackhawks, who have similarly leaned on their top-units for scoring. 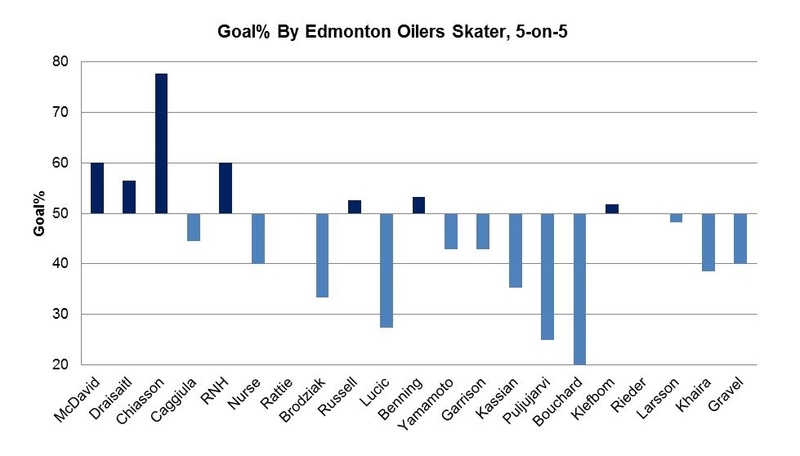 So we know the Oilers are ultra-reliant on their first line for scoring. That doesn’t necessarily mean that they have an underperforming team. After all, if the Oilers top line is handling the bulk of the scoring and their depth players are playing a high-quality game on the defensive side of the puck, that’s a recipe for winning games – a weird recipe, but a recipe nonetheless. This is gruesome. It’s certainly more evidence that the Oilers remain a one-line team and nothing else behind it. Some of the guys that Peter Chiarelli and the rest of the front office were banking on to have bounce-back years – be it Kyle Brodziak, Milan Lucic, or Zack Kassian – just haven’t delivered. It’s created another scenario where the Oilers, in the league’s weakest division, are merely fighting to stay alive. It will certainly be interesting to see what other moves the Oilers have up their sleeves to jump-start the rest of the offence. Last week, the Oilers traded Ryan Strome – a major disappointment in his brief stint – to the Rangers for Ryan Spooner, a player they feel can integrate himself better into the lineup. But Spooner has just one goal and one assist this season, and even if he returns to form, it’s hard to imagine he’ll be the first and only move the Oilers make this year. The reality is everyone in Edmonton is on the hot seat right now, and another missed postseason will almost certainly end with a wholesale regime change. So keep an eye on the trade market in the coming months. If the Oilers don’t believe they can find a solution internally, they will have to go outside for more help. It’s not a situation they envisioned themselves being in this early in the season, but there is still enough time to salvage this season.